We are thrilled to announce our new partnership with St. Jude Children’s Research Hospital! 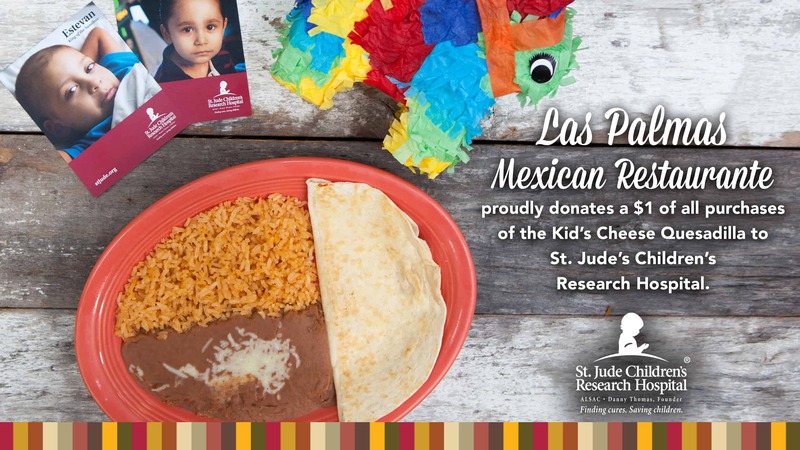 Starting on Monday, May 2, 2016, Las Palmas will proudly donate $1 from every Kid’s Cheese Quesadilla Meal to this wonderful organization. Founded by the late Danny Thomas, St. Jude is one of the world's premier centers for the research and treatment of pediatric cancer and other catastrophic childhood diseases. Children from all 50 states and from around the world have come to St. Jude for treatment, and thousands more have benefited from the research conducted at St. Jude because this research is shared freely with the global medical community. Most importantly, no family ever pays St. Jude for anything. We are so happy to play a part in the continued success of this great facility and organization, Come on, and bring the kids in to enjoy a delicious cheese quesadilla to help us help St. Jude! Click here to see how much Las Palmas has donated so far!